Plexidor Pet Doors: Frequently Asked PlexiDor Questions. dogs up to 200 lbs. If you need a pet door, the PlexiDor is definitely a good choice. It is sturdy, secure, energy efficient, and comes with a five year warranty. If you wonder something else about the PlexiDor, give us a call 1-800-749-9609 or comment on this post. You can also click here to navigate to the main PlexiDor website. The PlexiDor can be installed through a door, a wall, or even through glass. The part you see next to the doggie on the picture above goes on the inside of the house. 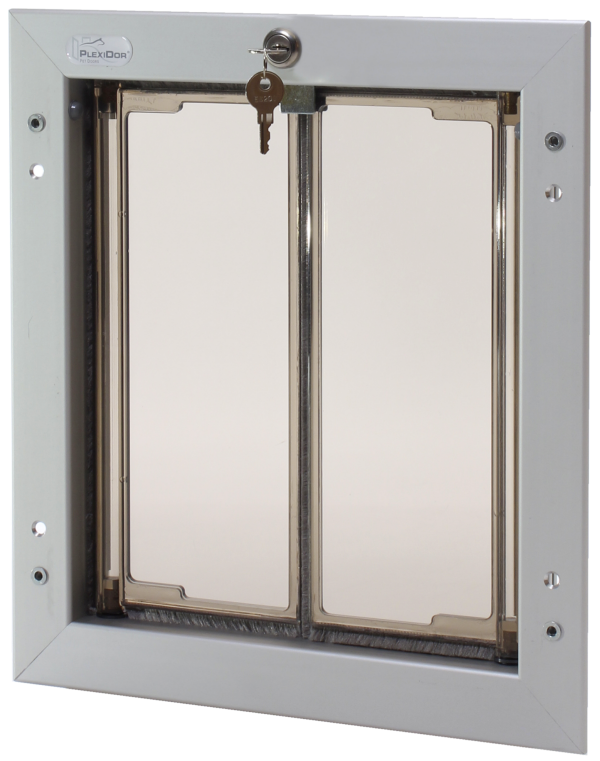 The PlexiDor units for door installation fits a standard US house door of 1.75" and the frame covers the cut-out edges of the house door. 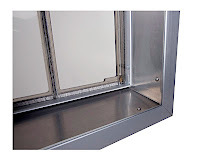 The units for wall installation come with an aluminum wall tunnel that is adjustable from 4" to 12" On the image to the right, the door is seen from the outside of the house. The aluminum tunnel is angled to drain water and snow to the outside. If you have the right size according to the size chart above, the answer is generally "Yes." The door isn't meant to be mounted flush with the floor; the pets lift their legs and walk/run over a threshold. The reason for this is that you want the opening to be as small as possible while still being big enough for your pet. Looking at the chart above, the extra large PlexiDor, for example, should be mounted 12"-14" up from the floor. Pets generally catch on to the idea quickly. Prop the panels open and tempt your cat or dog with a treat. Once they go through with the panels open, try the same thing with panels closed. Many pets who won't use other pet doors still like the PlexiDor because they can see the other side through the panel. My dogs chew on everything. Won't they destroy the door? to 100 lbs that like to chew. Some dogs do like to chew. The PlexiDor Top Swing is constructed for dogs up to 100 lbs who like to chew. 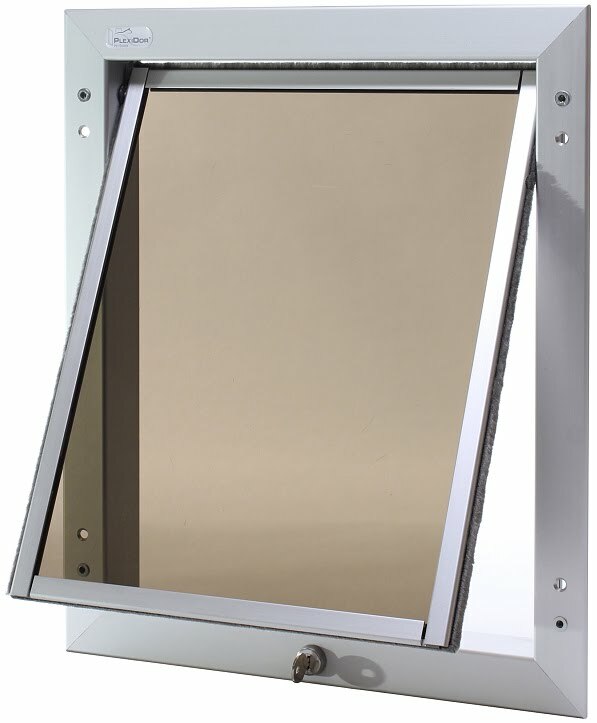 This door features a single plexiglas panel equipped with aluminum chew proof trim. Just like the other PlexiDors, it comes with a lock and keys, and a steel security plate. 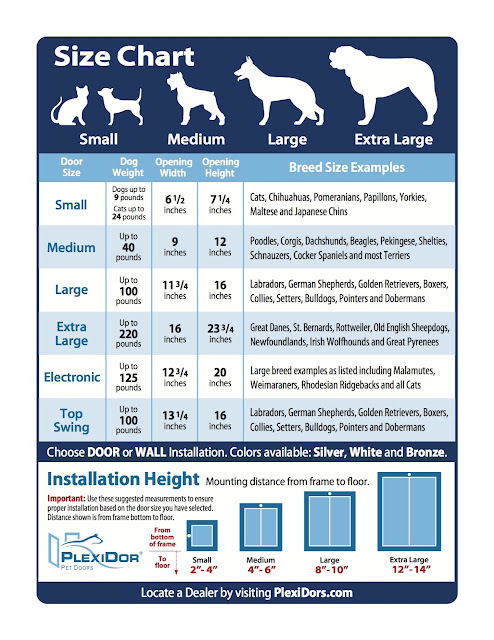 If your dog weighs more than 100 lbs, choose the PlexiDor extra large; this door also has aluminum trim around the panels. We can't guarantee that. 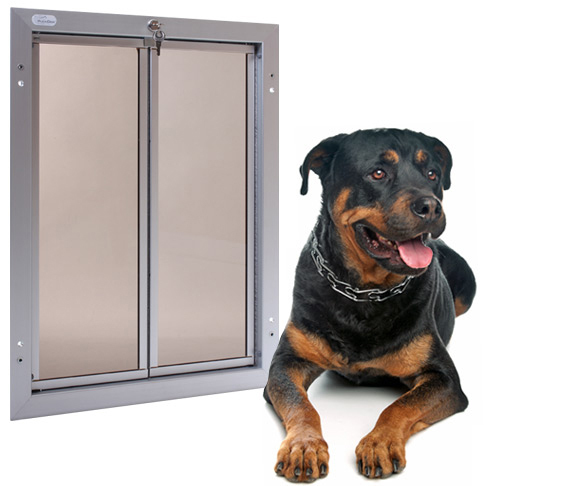 The PlexiDor Electronic opens only for pets with a key, but cats are quick and can follow the dog outside. 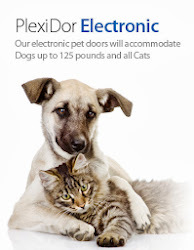 It's like a miniature garage door for pets. The pets allowed to use the door get collar keys with RFID. The keys are waterproof, shock proof, and do not require batteries. When the key comes close to the door, the panels slides up. You can program how long the door will stay open, and since there are thousands of RFID codes you can feel confident the door will only open for your pets, even if other animals in the neighborhood have similar keys. I'm so excited about your product! What I love the most is the ability to lock it AND to block it off. It's a dual safety feature that is attractive to us, because we've been burglarized and they came in through the doggy door. Scary! I remember you mentioning the burglary at BlogPaws. Just knowing someone had been in the house would freak me out, whether they were caught or not.